Scan Windows Shortcuts. 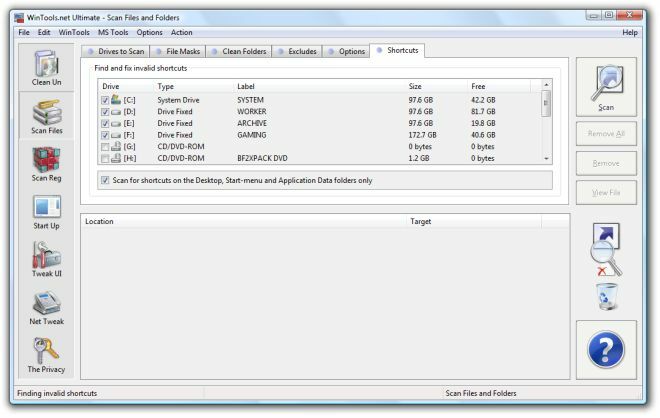 WinTools.net - software tools for MS Windows. The "Shortcuts" tab of the "Scan Files" tool serves for searching, correcting or deleting shortcuts with dead references. The method of searching for shortcuts is similar to the method which is used for work with the "Scan Files" tool. The Start button begins the scanning of the hard disk and placing of dead shortcuts on a list. After scanning you need to delete dead shortcuts using the "Remove" button. You can also correct shortcuts. Choose one shortcut at a time and press the "View" button. Copyright (c) 2002-2019 Godlike Developers - Software Engineering Group, Ltd. All rights reserved.